Leído con mi hija. Qué linda historia sobre un conejito que quiere ganar el concurso al mejor jardín. Muy bonito cuento infantil. Timo signs up for the Toadstool Corners Garden Tour and works hard every day to make his garden great. Telling himself he loves gardening, Timo misses out on all his friends' invitations for summer fun as he prunes, plants and weeds. When rain prevents him from finishing his preparations Timo feels grumpy. On the day before the Garden Tour, all his friends come and help Timo spruce up the garden. But the Garden Tour is rained out. At last Timo realizes that his friends have come through for him, despite his preoccupation with gardening, and he throws a picnic in the garden. Brightly colored illustrations of the jauntily clad animals add interest. The cover has a wrap-around design, and the endpapers show silhouettes of the characters. Includes a glossary of the flowers mentioned in the story.Although this is a handsome book, and the theme of friendship will resonate with the intended audience, I wonder if kids will get excited about a story of a garden tour. Also, the ending is abrupt. 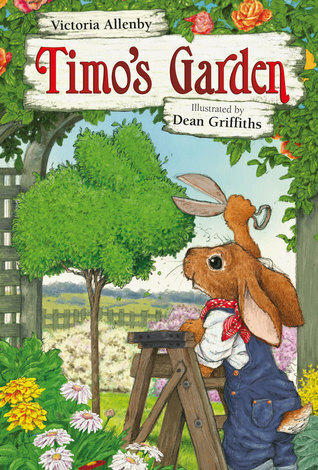 Timo is a young rabbit who enjoys gardening, and when he learns about Toadstool Corners' Great Green Garden Tour, he decides to make his garden even nicer. But he becomes so focused on his work that he neglects to make time for fun or for his friends. After a fierce rainstorm leaves his garden in a mess, his friends come to his rescue and fix everything right up. The storm causes the tour to be postponed, giving Timo time to repair the mess and add even more flowers to his garden. But this time he's learned his lesson, and he spends his time differently. The story from Canada has a lesson for everyone--yes, one that I could certainly stand to learn--and the illustrations are quite pretty. All the flowers mentioned in the story are labeled and sketched as part of the back matter. Adorable illustrations fill the pages of this beginner chapter book about Timo and his friends. In order to prepare his yard for the garden tour he passes up all the fun activities his friends invite him to play. When rain ruins all of his hard work he wonders why he decided to do it. However, in the end his friends come through for him and help him get his garden in tip top shape. A cute story about friendship, setting priorities, responsibilities and kindness for ages five to eight. Timo decides to enter the Great, Green Garden Tour, and he doesn't have time for his friends as he prepares everything. When a disaster strikes, and everyone pitches in to help, he learns that life is better with friends. Victoria Allenby Dean Griffiths - Victoria Allenby dictated her first picture book to her mother at the age of two. Since then she has learned to write things down herself, and today makes a living as a freelance writer and editor. She lives in Toronto with Cole, a cat who thinks he is much more interesting than laptops and books.